At their own expense and without benefit of a tax receipt, travelling volunteers go to countries to supervise the distribution of bedkits, photograph children with their bedkits, and write articles for the donor newsletter. Should you be interested in travelling with SCAW, please contact us to find out how you can attend the information session on Saturday, March 31st, 2007. 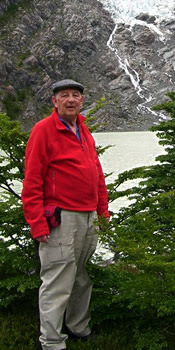 SCAW volunteer, Ken Graham (pictured left) will be presenting a travelogue of his adventure trip to the Antarctic and the Patigonia region of Argentina and Chile at the Century Church Theatre, Main Street, Hillsburgh. There is no admission but a donation to Sleeping Children Around The World would be appreciated. Light refreshments will follow. Everyone welcome. Come and enjoy a pleasant afternoon. The eight Four Points by Sheraton hotels in Ontario raised over $2200 for Sleeping Children Around the World through pie sales in the weeks leading up to Thanksgiving in 2006. Sleeping Children Around the World provides bed kits to needy children in developing countries, helping them to face the challenges of the coming day with the comfort of good night’s sleep. Pies were sold to guests at the front desk, to corporate clients, and at a pie baking contest held by the hotels. Participating were Four Points by Sheraton London, Four Points by Sheraton Ottawa-Gatineau, Four Points by Sheraton Toronto Airport, Four Points by Sheraton Toronto Lakeshore, Four Points by Sheraton Mississauga Meadowvale, Four Points by Sheraton Kingston, Four Points by Sheraton Toronto Airport West and Four Points by Sheraton St. Catharines Niagara Suites. 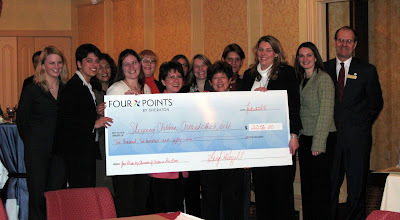 The proceeds were presented to the charity at a recent event at the Four Points by Sheraton Toronto Lakeshore. The funds raised will help to buy bedkits for children in Tanzania and will be delivered this summer. A bedkit consists of a mat or mattress, pillow, sheet, blanket, mosquito net (if applicable), clothes outfit, towel and school supplies. Bedkit contents vary from country to country depending upon local needs. Sleeping Children Around the World is a Canadian registered charity which sends bedkits to children in developing countries through free-will donations and partnerships. All donations go directly to the bed kits and do not cover any operating or overhead costs.